Go to… Go to… Home Featured Listings - Single Family Homes - Condos - Active Listings - Open Houses Search for Homes - New Construction Home Search - Advanced Search - Map Search - Foreclosures - Tampa - Wesley Chapel - Land O Lakes - Lutz - Riverview - Brandon - St.Petersburg - Clearwater - Apollo Beach - Oldsmar - Belleair Beach - Redington Beach - Lithia - Odessa - Trinity - Commercial Search Buyer/Seller Info - What is a CDD? - Mortgage Rates - Schools - Relocation - Weather About Me - My Blog - Testimonials Contact Me - Dream Home Finder - WHAT'S MY HOME WORTH? - Real Estate News!!! UNDER CONSTRUCTION* Starkey Ranch set against an old Florida, natural backdrop, this West Pasco County, master planned community will make all whom enter feel right at home. 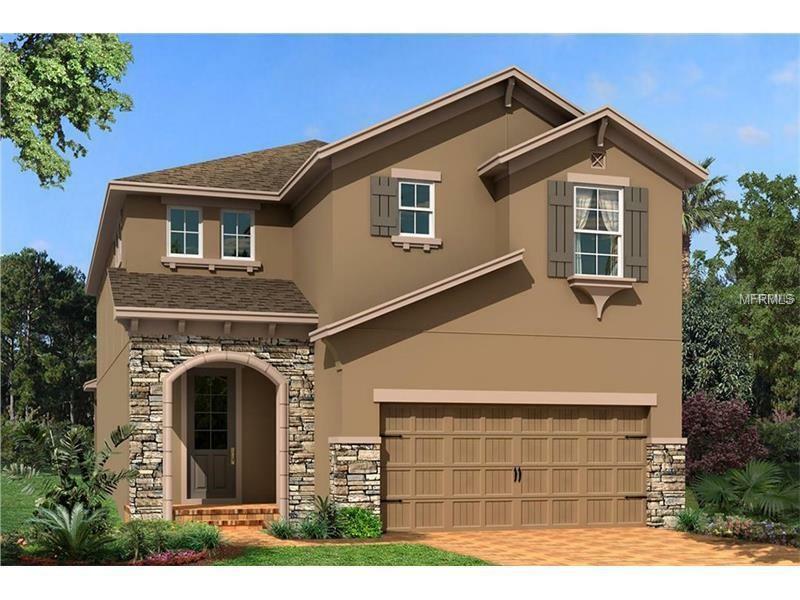 This two story floor plan is a 3/2.5/Flex/Bonus Room/2 car front load garage home. This home features an open floor plan with the kitchen/family room combo. You also have a separate café area perfect for a large table off the kitchen and plenty of room to entertain. The kitchen has a large island with exquisite upgraded qusartz counter tops, 42” upgraded cabinets throughout with crown molding, gourmet kitchen package including stainless appliances, gas cooktop and double oven. Your deluxe master bath includes a large shower, garden tub, dual sinks, quartz counter tops and upgraded wall tile. All three bedrooms are upstairs as well as the open bonus room and a tech/reading area perfect for a desk. This home is loaded with upgrades, too many to list! Starkey Ranch is one of kind including over 800 acres of parks and Future Amenities to include district park for sports and recreation, community pool, dog parks, community theater, K-8 school, library and 20 miles of trails connecting to Starkey Park Nature Preserve. This home also features a 15-year transferable structural warranty! Welcome home to luxury! Please note that pictures shown are a REPRESENTATION of the home and floor plan and may NOT be the actual home itself. The pictures are for INFORMATIONAL PURPOSES ONLY. Home | Open Houses | Single Family Homes | Condos | Active Listings | About Me | My Blog | Contact Me | Real Estate News!!! | Search for Homes | Advanced Search | Map Search | Foreclosures | Tampa | Wesley Chapel | Land O Lakes | Lutz | Riverview | Brandon | St.Petersburg | Clearwater | Apollo Beach | Oldsmar | Belleair Beach | Redington Beach | Lithia | Odessa | Trinity | Commercial Search | New Construction Home Search | Mortgage Rates | Buyer/Seller Info | What is a CDD? Copyright © 2019 Mid Florida MLS. All rights reserved. The data relating to real estate for sale on this web site comes in part from the Internet Data Exchange Program of Mid Florida MLS. Information provided is for consumer's personal, non-commercial use and may not be used for any purpose other than to identify prospective properties consumers may be interested in purchasing. Future Home Realty participates in the MFRMLS Internet Data Exchange (IDX) program, allowing display of other MFRMLS broker's listings on this site. However may not include all listings currently available. Information is deemed reliable but not guaranteed. Information last updated at 2019-04-25 04:56:17.